The Royal Domain of Drottningholm is an 18th century European royal residence influenced by Versailles. It is located on an island near Stockholm. 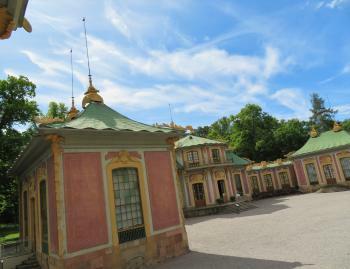 Besides the castle itself, the Chinese Pavilion and the Drottningholm Theatre are part of the site. The Castle was built around 1700 by the architects Nicodemus Tessin the Elder and Nicodemus Tessin the Younger. The Theatre and the Pavilion date from the late 18th century. The Chinese Pavilion is a mixture of rococo and oriental decorations, which was very fashionable at the time. Since 1981, Drottningholm Castle is the residence of the Swedish Royal Family. I have to make a confession: I didn´t really visit this site on my first attempt. But that was not my fault: everything in Sweden seems to close down for the winter, even if it is such a beautiful sight to see places covered in snow. So I just got on a bus to Drottningholm (15 minutes from Stockholm), took some pictures and left with the next bus. Superficially, the palace looked better than I had read about. Probably it´s the inside that´s boring (another European castle), but the location near the water is great. 12 years later I made up for it: I had some time left after visiting Hovgarden, which lies about 35km up the road from the palace. The weather was sunny enough to try and get some better pictures of the site. I arrived at about 4 p.m. - actually too late to get inside the palaces (which close already at 4.30). So I wandered around the gardens, much further than I had on my first visit. What struck me was how much it resembles Versailles. I got as far as the Chinese palace and the remarkable Guards' Tent. Both buildings are worth a quick look for their quirkyness, but in all this site still did not win me over. 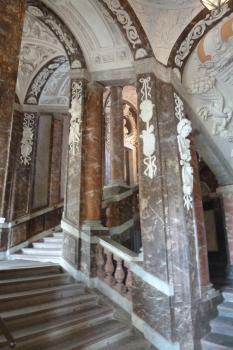 After Versailles, and even Potsdam, this almost looks like a reproduction. I visited this WHS in July 2018. To get there and back, I took the Drottningholm Ferry from near the Rathaus jetty as it was included in the Stockholm Pass (not recommended!) together with the Heritage Ticket which included visits to the Drottningholm Palace, the Chinese Pavilion and the Theatre. The gardens are free to visit. Having visited several palaces around Europe, WH listed and not, I wasn't too impressed by the palace interior and if you don't have much time you won't miss much by skipping it and heading directly towards the gardens. 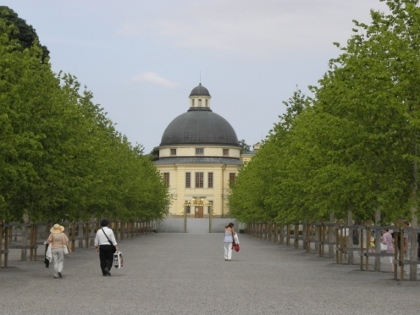 The exterior is quite similar to the Augustusburg Castle in Bruhl, Germany and is rather plain to be considered a miniature version of Versailles. It is still used as the residence of the Swedish Royal Family and some parts are obviously out of bounds. The overall visit of the Palace interior and exterior was a way comparable to the Blenheim Palace in the UK. The best light for photography of the palace facade is in the afternoon. Approaching the palace by boat was rather pleasant and the sunlight in the morning is great for photos of the rear part of the palace. After visiting the palace interior, I passed through the iron gate with the golden royal emblem to visit the huge gardens. I had already got a glimpse of their size from my window seat upon arrival in Stockholm. The highlights of the gardens were the empty aviary, the Chinese pavilion and the guards' tent, which was built as part of the backdrop for the Court theatrical events but was used as a royal barracks. Nowadays, the guards' tent has been converted into a cosy covered picnic spot and it contains the UNESCO WHS inscription certificate too. I preferred the Chinese Pavilion in Potsdam, Germany even though here I particularly liked the lovely wallpaper with different types of birds. Last but certainly not least, I headed again towards the palace and noticed that I had overlooked a rather plain building just next to it which housed the Drottningholm Theatre (photo), built in 1766 at the request of Queen Ulrika. The theatre auditorium is decorated using paint and the faux marble effect, stucco, and papier mâché. The true highlight of this theatre and of this WHS for me was the wooden stage machinery which is operated by hand and is still in full working condition. It includes wind, thunder and cloud machines, as well as traps and moving waves (it was amazing to see and hear the machinery in action during the guided tour and it must have been an incredible experience back in the days when no computer and audio effects existed. 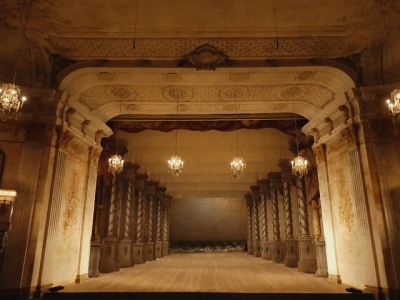 About 30 stage sets have been preserved, all decorated with themes from 18th century. 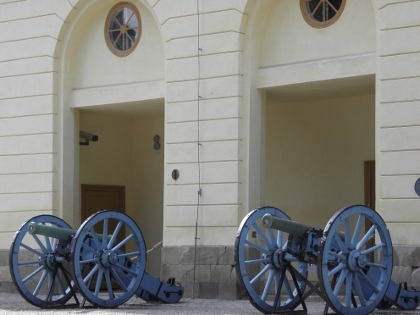 Drottingholm is a very easy and (weather permitting) enjoyable half-day trip from Stockholm. After visiting several palaces and castles during my time in Denmark and Sweden, the main interior (however nice) was not my main draw. So after about 45 minutes within the palace, I was ready to explore. I was most interested in the gardens and Chinese Palace. I was surprised to learn only 9 staff manage the enormous grounds! Believe me they are larger than they initially appear. The views of the palace from the water and the gardens are splendid and once again I was lucky enough to have excellent weather. During our walk to the Chinese garden, we felt completely relaxed and alone, since we were at the palace as it opened. With only our thoughts, the sound of birds, and the fresh smell of flowers we cherished the mild warm of a Swedish Summer. The Chinese Palace, while not particularly reflective of Chinese architecture is fascinating. The interior is mostly bright colors of green and pink. There are artifacts and furniture from China and Japan specifically. It is a curiosity in the 21st century, 17-18th century European views of the East are on full display here. Drottingholm did remind me of Versailles, but the size is on a much smaller scale. I enjoyed my visit and would encourage travelers to explore the grounds and Chinese palace as well. I also wished to visit the theatre, but time and cost persuaded me to skip it. As World Heritage Traveller I have visited over 250 UNESCO-sites in the world. But in my hometown there are also 3 sites to see, that tells the story of three historic periods in Swedens capital Stockholm. This film covers the Drottningholm Castle, built between 1662 and 1750 and now also is home for the Swedish King. Located outside Stockholm on the Island of Lovön, the Versailles of Sweden, Drottningholm Palace was my first Swedish and Scandinavian World Heritage Site I visited in the year 2001, it was a fondly memory that I had a chance to unexpectedly greet by HM the Queen of Sweden while my mother and I joined the palace tour. Revisited in 2012 I took the same old way by using the T-Bana to Brommaplan then bus to the palace. The first view of Drottningholm by the lakeside was beautiful as always. My friend and I entered the palace, after saw many royal palaces in recent years, my views on Drottningholm changed badly. The first time I visited here I was pleased to see the interior, but for second time I hardly enjoyed or excited and even bored! The best thing of Drottningholm was its garden behind the palace; I really liked the size of the garden as it was not too big and the distance from the palace to Chinese Pavilion was lovely for leisurely strolling. 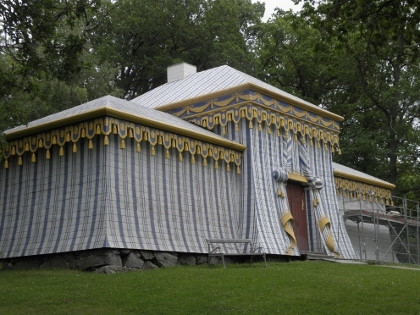 The Guard Tent was another highlight; this white-blue copper tent in the garden was full of details and quite unique to Swedish Palaces; however this tent was not the best in my opinion, the one in Haga Park in Northern Stockholm was much better. The Chinese Pavilion in the far end of the garden was quite nice but nothing looked Chinese at all! Nevertheless the curved line of its copper roof, and some furniture inside the pavilion were quite nice. The only regret for me was that I never had chance to see the interior of the Court Theatre in both trips. Drottningholm was a fine World Heritage Site with nothing special or unique from other European Palaces. However if compared to other palaces outside Stockholm, Drottningholm was quite lovely and its many French elements were quite fascinating that how French absolutism be interpreted by Swedish monarchs. 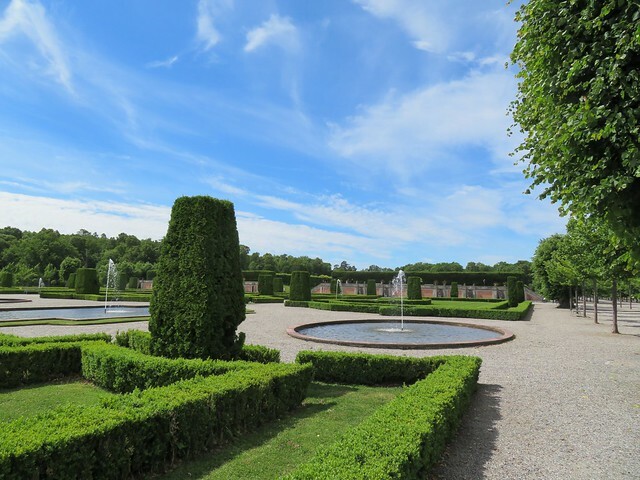 One suggestion from me would be that there are two must see palaces in Stockholm, the Royal Palace and Drottningholm Palace, better to see the Royal Palace first, and if you still need more royalty then Drottningholm should be your next. I have been to Drottningholm twice now, and I can't really say I enjoyed this place. The first time I did a bus tour of Stockholm that included a brief guided visit of the palace itself. The guide dragged us through the most important rooms in maybe 20 minutes, and we hardly got to see the park, which seems to be the nicest part of the site, judging from the other reviews. I didn't find the palace itself particularly impressive or interesting. My second time in Stockholm, I somehow miscalculated my timing, and when I arrived after a very scenic boat trip, the palace had already closed, and I only had a few minutes to take a quick look at the theatre and the park before the boat's departure. I thought the boat ride from the city centre and back was the best part of visiting Drottningholm, even though the park may also be very nice. 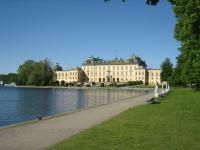 I visited Drottningholm Palace in August 2008 as a tourist. I filmed the exterior of the palace, the sentries and the beautiful views of the gardens and lake. I also went on a guided tour of the interior, but it was not possible to film inside. It was an interesting, informative tour--the guide spoke excellent English--and it deepened my knowledge of Swedish history. The weather was fine pleasant which made the visit particularly enjoyable. As already stated the Palace closes down for a few weeks in mid December – January so I didn’t actually get to visit the inside of the Palace. I must admit there was a slight sense of relief when we had it confirmed that you couldn’t get inside, as we really were not excited by a trot around another European Palace. We did however enjoy a walk around the planned gardens up to the Chinese style Kina Slott. Had this been one of the first Royal Palaces I visited I would probably say it was great, but having already viewed an awful lot of them it just seemed nice and a good place for a walk. We arrived just as the guards were changing which added a little bit of entertainment, also the gift shop was open so we ducked in there and saw the certificate confirming its inscription of the World Heritage List. If you have plenty of time in winter then this is a decent trip out from Stockholm, if you visit in Summer I can imagine this is a really worthwhile trip if you take the boat out from the lovely Stadtshuset in Central Stockholm. Stockholm itself was a really enjoyable and unique city to visit, being set across numerous islands, with a great ‘Old Town’ and super cool hotels (Nordic Light a decadent treat), bars and shops. It was a great place to see in the New Year. We had plenty of time whilst we were in Stockholm so this was an enjoyable visit, I would like to have seen the theatre as this may differentiate it from many of the other palaces on the World Heritage List, and the gardens did provide a nice place for a walk. Being Swedish and grown up in Stockholm, Drottningholm was probably the first World Heritage Site I ever visited, long before UNESCO’s took the initiative to create the famous list. For me personally the site is associated with many memories and it’s truly a wonderful place for an excursion while visiting Stockholm. The castle and its surrounding park is obviously best visited in the summer and the best way is to approach the site is by boat. Many tour boats depart from the Town Hall in central Stockholm and it takes about an hour to slowly cruise through Lake Mälaren on a steam boat, a nice experience in itself. The castle is inspired by Versailles but obviously not as enormous as its French cousin. Still it has played an important role in Swedish history. You will find wonderful French and English park as well as the oldest theatre in Europe still in use. A slow stroll through the park to the China Castle, were you will find a nice café, is an absolute must. Seldom noticed by the tourist is the small village on the right side of the main road that runs by the castle. This village was planned and built in the mid 18th century for the people working at the castle and contains many picturesque houses and villas and is in itself a good example of how a Swedish village once would have looked like. Don’t miss this when you visit Drottningholm. I visited Drottningholm in mid-June, and the weather was still quite cold as it was raining. It is easily accessible by bus from the Stockholm city centre, it is closer to the suburb of Bromma. It is based on Versailles, but is on a smaller scale, of course. The two main attractions are the Chinese Pavilion (which was a surprise birthday present to Queen Lovisa Ulrika, in 1753! ), and the famous 18-century court theatre, where many opera videos and recordings have originated from. The Chinese Pavilion has several beautiful rooms, filled with porcelain, vases and statues. The court theatre, built by Carl Fredrik Adelcrantz, with its pseudo marble, painted fake doors, old thunder machine and wind machine, is a fascinating journey into the opera productions of the early history of the genre. The palace interior is not very impressive by central European standards, but the lakeside and view of the gardens at the back are stunning. There is also a chapel with a small dome that welcomes a weary traveller after a trek through the vast gardens. 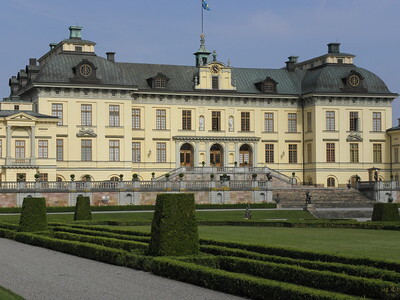 The Palace is included free of charge, on the Stockholm A La Carte pass, issued by Destination Stockholm.